An image from a 40-hour time lapse that captured 30 inches of snow falling on the city of Boston. This week's northeast blizzard may have shut down roads and businesses, but it was also beautiful. And serene. And the source of some awesome video. Here's a 40-hour time lapse video of the snow falling and piling up on the roof deck of IDG's headquarters in downtown Boston, 16 stories up, shot and edited by IDG News Service video reporter Nick Barber. Don't worry, Nick didn't stand on the roof the entire time. He had a GoPro camera set up inside, programmed to take one picture every 30 seconds between Monday afternoon and Wednesday morning. Roughly 4,800 images were captured. 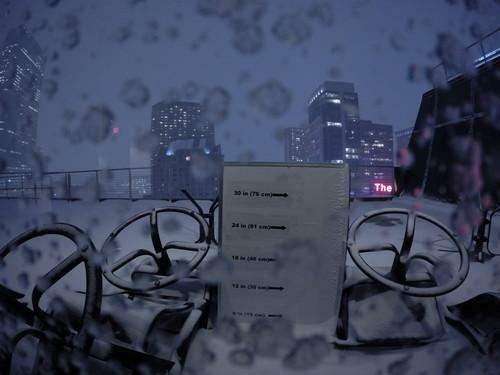 In the resulting video, the snow comes to life, taking on a wave effect as it creeps up the glass windows of a nearby conference room, rising as the sky changes colors. Coupled with the ambient music, the video plays like a dream. "Meteorologists were predicting a snowstorm of historic proportions, with parts of New England slated to receive up to three feet of snow," he said. "If there was ever a time to shoot a time lapse of snow piling up, this was it."